To put it bluntly, bathrooms are where dreams of neat, efficient storage options go to die. There are always good intentions; visions of fluffy rolled towels, toiletries arranged in ascending height order, hair styling tools that coexist in perfect harmony, and everything smelling faintly of sandalwood and vanilla. Unfortunately, the reality of bathroom storage tends to be far from pretty. Think: snake pits of tangled cords, drawers groaning under the weight of half-finished beauty products, piles of damp towels heaped on flimsy drying racks, and every spare inch of cupboard space occupied by rogue bobby pins. And nothing smelling like anything resembling sandalwood or vanilla unless it’s tipped over and spilled in a drawer. There’s an even better use for magnets than composing dodgy poetry on your fridge door (hard to believe, I know). 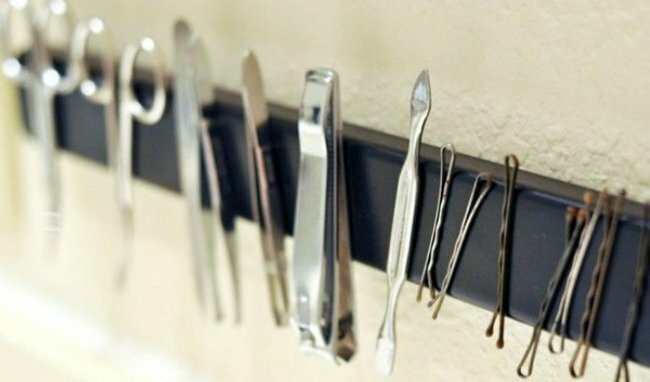 A magnetic strip affixed inside your bathroom cupboards, behind the mirror or along the wall is a seriously clever storage solution. Nail clippers, bobby pins and scissors will all stick to it naturally, but if you also stick magnets on the back of your toothbrushes, bottles and other bits and pieces you’ll free up even more space in your drawers. Nailing wire baskets to your bathroom wall by their bottoms is an easy way to create more storage space for toilet rolls, makeup, towels - whatever you need to put away. Add a photo for a cute personal touch, and if you&apos;re renting, there&apos;s toothpaste on-hand to plug the holes when you leave. via Elsie Larson of A Beautiful Mess. Jars, jars, jars - they&apos;re very useful things. Affixed to your bathroom wall, they&apos;re the perfect solution for toothbrushes, makeup brushes, and those dastardly bobby pins. Plus, you can lift them out of their fixings and wash them when they get gross. "Plating up" isn&apos;t only relevant to Masterchef contestants. As this photo demonstrates, a couple of plates or bowls, plus a candlestick holder, makes an easy yet quirky storage option for your bathroom counter. It doesn&apos;t have to be expensive crockery, either - your local op shop probably has some cute, ornate kitchenware you can snap up for a bargain price. Cake stands tend to go for extra cheap, because no one uses them any more. Now, sacrificing a wine rack is not advice we give lightly. But in the interest of a beautiful, tidy bathroom, it&apos;s probably worth keeping your wine in the pantry for the time being - because a wine rack is the perfect place for your (beautifully rolled, clean) towels. Whether it goes on the floor - like the one pictured - or hangs on the wall, a wine rack keep your towels accessible and out of the way all at once. As for what happens to your wine - we&apos;ll leave that up to you. 6. Who needs a shoe organiser anyway? The best use for a shoe organiser has nothing to do with shoes. Simply hang one inside the door of your bathroom cabinet, or the back of your bathroom door and you&apos;ve got a handy place to put your cleaning products and other space-consuming items. Hooray for freeing up more space for the essentials, like your five bottles of dry shampoo. Do you have any bathroom storage tips to add to our list?